The president wistfully reminisces about the utter aggravation of his first term in office. 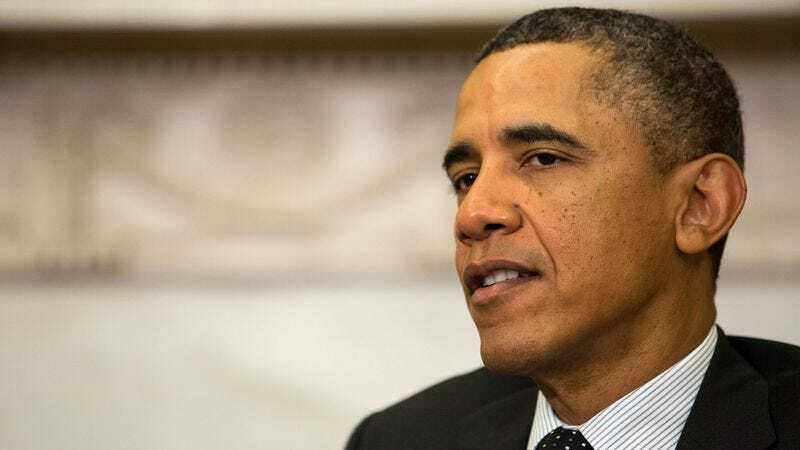 WASHINGTON—Saying that those were definitely some good times, a reflective President Obama told reporters Friday that the current scandals plaguing his administration have made him long for the deeply frustrating, often maddening political climate of his first term in office. Obama, who is currently facing three high-level political scandals that include the IRS’ unfair targeting of conservative groups, the Department of Justice’s questionable probe of the Associated Press, and the murder of a U.S. diplomat in Benghazi, said he can’t help but smile when he remembers his early, thwarted years as president when he was unable to bring Democrats and Republicans together on health care or lobby Congress to pass immigration reform. The president then affectionately reminisced about when Mitch McConnell (R-KY) said his one goal as Senate Minority leader was to make Obama a one-term president, and told reporters that, with the current onslaught of criticism facing his administration, he often finds himself yearning for the tumultuous months in 2009 when unemployment was at 10.2 percent and his stimulus plan faced constant scrutiny. The president also tenderly recalled his horrendous first debate with Republican presidential nominee Mitt Romney, saying that awful night now holds a special place in his heart. According to sources within the White House, the president has been in a reflective mood since news of the various scandals broke, often taking aides aside and fondly recalling the hellish nightmare of his first term when he realized he couldn’t live up to anyone’s expectations and his once sterling approval rating dropped precipitously in mere months. One high-level official said that after the White House was forced to release emails sent during the Benghazi terrorist attack, the president, in an effort to calm himself, mused warmly on how torturous it was dealing with House Minority Leader Eric Cantor (R-VA) during his first term, and how he actually thought about punching him in the face during many of his Oval Office visits.